Ever wonder what Ambre carries around in her purse? We want to give you an inside look! 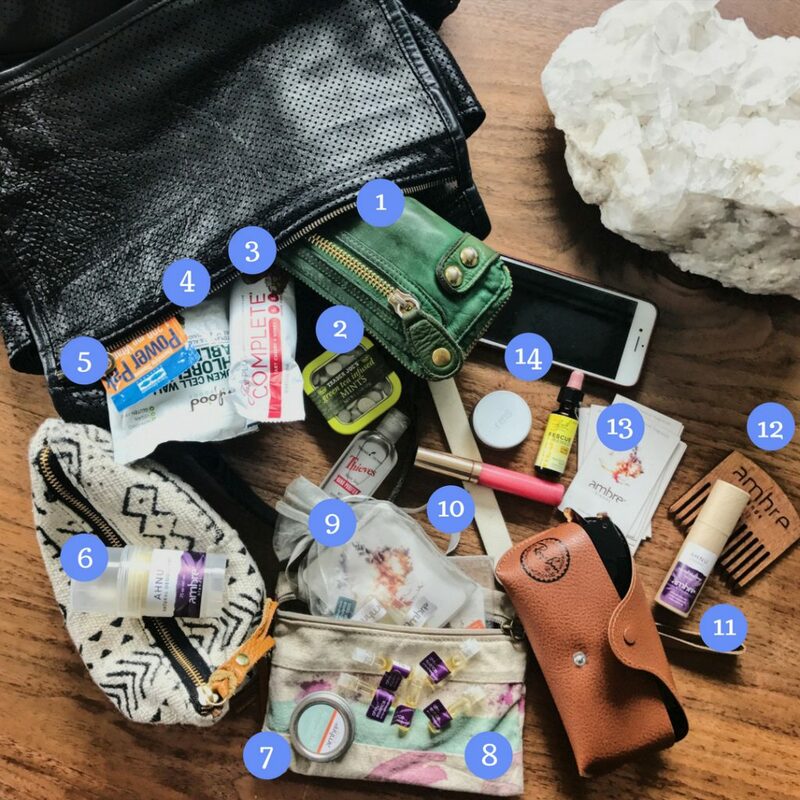 Ambre breaks it down in today’s blog to show you some of her favorite products and what she has inside her purse. Green Wallet: Everything around you is energy! Feng shui can help remove blockages and transform your energy, and you can even feng shui your wallet. The green color is associated with wealth and growth while the gold correlates with fortune and abundance. I have been using this wallet for the past eight years! Trader Joe’s Green Tea Infused Mints: Infused with organic matcha green tea and combined with peppermint oil, these mints are great for fresh and clean breath! Juice Plus+ Complete Nutrition Bar: I always keep a Juice Plus+ bar in my bag for nutrition when I’m on-the-go. I love the Tart Cherry and Honey flavor! Sunfood Broken Cell Wall Chlorella Tablets: This superfood helps detoxify, alkalize and nourish your body. I take several of these tablets each day with water and in smoothies! Trace Minerals Research Electrolyte Power Pak: Whenever I need a boost of energy, I drink a Power Pak with water. These are also great for a healthy immune system. Ahnu Natural Deodorant: Our natural deodorant comes in a .75oz size that is great to throw in your bag in case you need a little refresher. I’m currently obsessing over the Ahnu! Lip Remedy: I’m so excited for the launch of our new Lip Remedy in November, we are switching to new packaging that we think our customers will love! Ahnu Samples/Sample Pack: I’m extremely excited about the launch of our fifth scent for both what it means and how it smells. I always carry samples in my purse so I can share with everyone I meet! Young Living Thieves Waterless Hand Purifier: This hand sanitizer uses natural peppermint oil to cleanse, which is great for on-the-go. Beautycounter Lip Gloss: I love Beautycounter products for safe and clean beauty! This lip gloss goes on smooth without being sticky. Ahnu Roll On: This is my jam right now and I blend it with everything! Ambre Beards Pick: All of our Beard Kits come with a handmade beard comb made in the USA from renewable sourced American Red Oak. We even coat these with Ambre Essence to seal the wood and leave it smelling great. It’s great to have on me for the entire family even as a hair comb! Rescue Remedy: If I’m doing a presentation or giving a speech, I like to drop some of these homeopathic drops in my mouth to take the edge off. RMS Tined Lip Shine: RMS Beauty is my favorite makeup line, I’m a lip gloss/balm junkie!